I even let her borrow my broom... hahahaha Look close, it actually has real broom straws. Anyway, I just thought since it was a rainy day outside, dark and gloomy that I would make a card to sort of match the mood. The witch sentiment I used was Wanda the Witch from Dude Time Doodles and thought I would also post it in their challenge. So I hope enjoyed the scary card, laughed a lot and enjoyed your visit. I love the fold of this card - very effective! Love what you have done with the freebie image at Dude Time Doodles this week!! 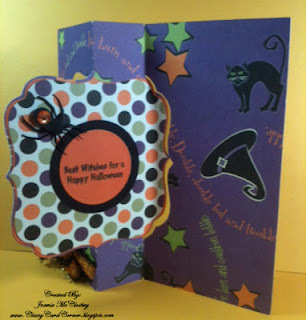 What a super fun card shape, and you used Wanda so well on this! Thanks for joining us at Dude Time Doodles (I was a tiny bit scared when I realized she had a real broom - LOL). Fabulous flip card and Wanda is perfect for it. Love that the broom has real straws. So glad you joined us for the Freebie/Guest Designer challenge at Dude Time Doodles this week. Super card and super fold! 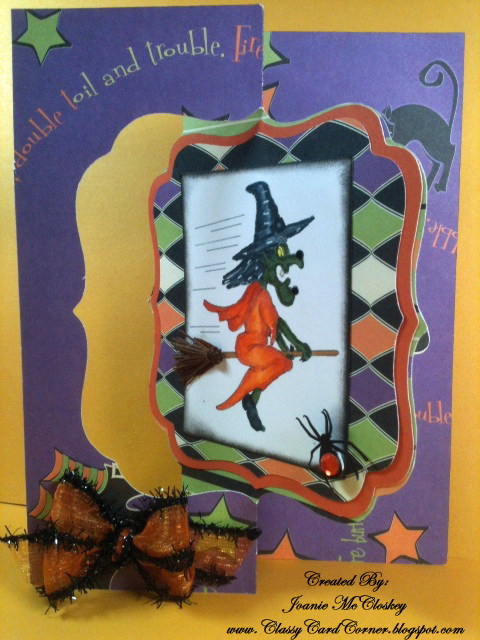 Love all the fun Halloween colors you used for this cute card! Thanks for joining the freebie/guest designer challenge at Dude Time Doodles! Fabulous card Joan, I like the papers and the design,Thanks for joining in with us at Dudetime Doodles this week, Good Luck. 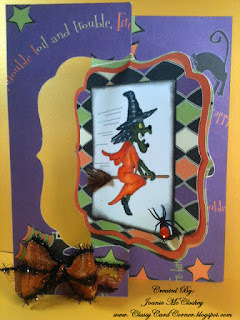 I love purple and green with halloween images! Great fold on this card and so much fabulous detail! Beautiful job and thanks for joining us at Dude Time Doodles this week! A super card and great use of the freebie image. Love the real broom straws. Thanks for sharing with us at Dude Time Doodles and good luck. Hey Joanie, I love your card! Wanda looks great! Thanks for playing at Dude Time Doodles this week! What a fun card! Saw it at Dude Time and had to come by for a closer look. Fabulous fancy folds! This is one super fun card...love the inside too! Such a cute Halloween card!! !